We are discussing the 10 commandments today. I have created a set of teacher's visuals and a student workbook that can be used with the lesson. 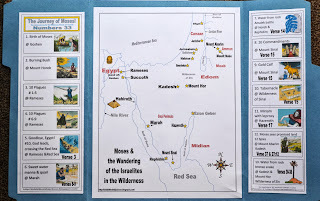 Review: We are studying Moses and we learned about Moses and his brother Aaron going to Egypt and talking to Pharaoh about letting his slaves, the Israelites leave. Pharaoh said no, and then God sent the 10 plagues. They left Egypt and are wandering in the wilderness for 40 years. God sends them manna and quail to eat. Last week, Moses hit a rock and water came out for them to drink! 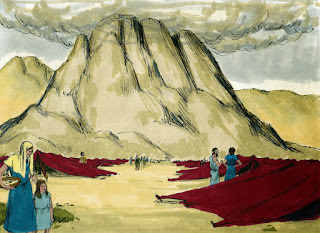 Lesson found in Exodus 19-20: Three months after the Israelites left Egypt, they came to the wilderness of Mt. Sinai. Moses went up to Mt. Sinai and God talked to him. 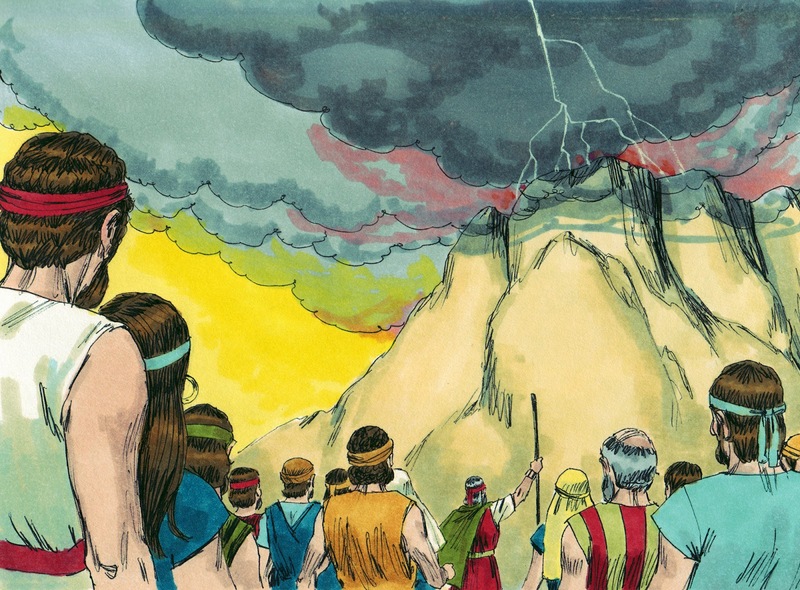 God told Moses to have the people wash their clothes and on the third day, God would return. 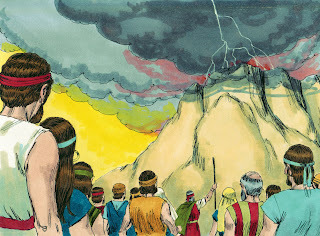 When the people heard the trumpets, they were not allowed to touch the base of the mountain or they would die. Mount Sinai was completely covered in smoke and the whole mountain was shaking! The trumpet blasted louder and louder, Moses spoke and God went to the top of the mountain. He told Moses to come to the top of the mountain. God told Moses to go remind the people not to come on the mountain, and tell them they are not permitted to look on the face of God. 1. Have no other gods. [You shall have no other gods before Me. vs. 3] God has made this clear in both the Old and New Testaments. Be careful how much time and money is spent on things. It can be something we collect, a person (discuss this) or when you get older, maybe a job. God wants us to worship Him only. 3. Do not take the Lord’s name in vain. [You shall not take the name of the Lord your God in vain, for the Lord will not hold him guiltless who takes His name in vain. vs. 7] This is a big problem! Taking the Lord's name in vain is using His name for no reason, or using it as a swear word. It is wrong and God tells us not to do it! When someone says "Oh my G*d!" God's name is being used in vain, and it is wrong. When someone says "OMG", it means the same thing, and it is wrong. Wow! I don't even like typing it to make it clear what I am talking about! Christians are not to use God's name this way! Just because your friends do it, doesn't make it right. 6. Do not murder. [You shall not murder. 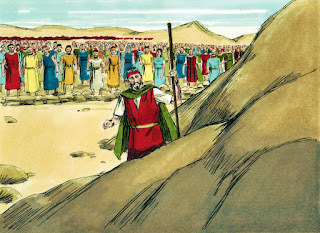 vs. 13] Remember, we talked about Cain and Abel? Cain killed Abel. And, God made Cain leave his parents, Adam & Eve. Part of murder is using self control. Control your temper, be careful of the friends you pick. 7. Do not commit adultery. [You shall not commit adultery. vs. 14] God tells us that when you pick your spouse (husband or wife), it is for life. God wants us to be faithful to our spouse and to Him. 8. Do not steal. [You shall not steal. vs. 15] God said very simply it is wrong to take something that is not yours. 3 words! Very clear! Do not steal! 9. Do not lie. [You shall not bear false witness against your neighbor. vs. 16] This is the same as the last one! 3 words! Do not lie! Tell the truth! Usually, one lie leads to another lie, and then you are just making the situation worse! 10. Do not covet. [You shall not covet your neighbor’s house; you shall not covet your neighbor’s wife, nor his male servant, nor his female servant, nor his ox, nor his donkey, nor anything that is your neighbor’s. vs. 17] This is to want what your friend/neighbor has. (Greed/envy) Don't be jealous because your friend has something that you want! Be satisfied with what you have! 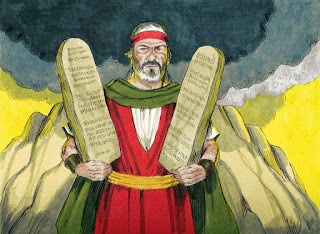 Next week we will continue this lesson and talk about what happened when Moses took the 10 commandments to the people! These are my 10 Commandments Visuals that I made from slate. The photo above shows my Mount Sinai visual that I made and used for this lesson. Click on picture to see the directions. 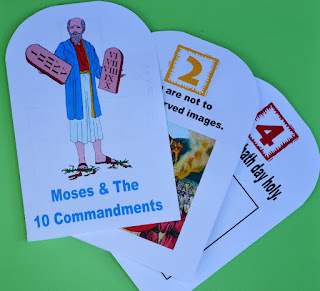 The 10 commandments visuals are the same as the student workbooks, but the teacher's visuals are a full page. They can also be used for bulletin boards, etc. Click here to print the teacher's visuals that were used. This is the student book that is the same as the book below, but has everything already on the correct pages to be used for the teacher. Click here to print the finished student book. Click here to print the student book. This is today's cut & glue picture to color. 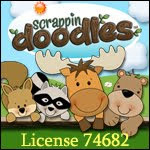 I print the backgrounds on different color cardstock, and the pictures for the students to cut are on regular paper. You can print it here. 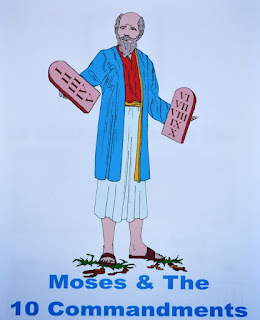 Click on the above picture to see all the Moses cut & glue worksheets and the pictures to color. We marked our Moses map for his travels. You can find more information here. 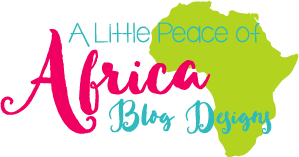 Click here to print the student Bible verse for today here (6 per page). Click here to print the teacher's Bible verse (1 per page). You can find more on the 10 Commandments, including a lapbook here. Thank you! Appreciate you stopping by and leaving the nice comment! Thanks for hosting the link up parties! Thanks for stopping by! I appreciate it! Any child would pay attention to this lesson! I love it, it's so creative. Thanks so much for the really nice comment! I appreciate it and thanks for stopping by! I wish I would've had more time with my children to give them their religious lessons faithfully, but being a single Mom & working constantly due to four children, and only my salary I miss the time I should've had with them. My Mom did take them to church (they took turns), but they did all make their sacraments. I made sure of that. My grandchildren though what is wrong with kids today. They don't get the religious up bringing they had or even I had. My daughter has four kids & she tells me it's because of the cost. That's just a darn shame. I love your post. I should copy it and give it to each one of my grandkids. Thank you for sharing. Thanks for visiting! I appreciate the comment! 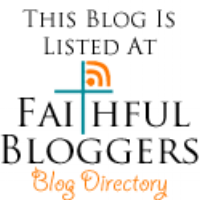 Thanks for linking up with us, Debbie! Thanks for hosting! I appreciate you stopping by. Thank you for sharing this lesson. I hope many find it and are blessed through it. Thank you so much for the nice comment! I appreciate it and thanks for stopping by! you are awesome. thank you so much . you are so talented. Thank you! Glad you stopped by! I appreciate the nice comments! Images are so good.God bless you. Thank you for the comment! I appreciate it! Keep up the good work and may God bless every of your effort. Love all your worksheets and visuals. I'm not sure if someone already mentioned it or not, but in the file folder document, the 3rd commandment is missing "vain." Thank you for your comment and especially for letting me know about vain. It has been corrected. I want to be a kid and sit in your class when you use your Mt. Sinai model! For verily I say unto you, Till heaven and earth pass, one jot or one tittle shall in no wise pass from the law, till all be fulfilled. 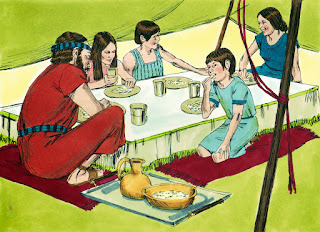 If He teaches not one thing will be changed why has man changed God's Sabbath day? Man did not change the day of worship. This was changed by Jesus when the Old Laws were not in effect after His death and the New Laws were put in place by Him. You can find a lot of scripture to prove this on this post: http://www.biblefunforkids.com/2016/01/old-law-vs-new-law-interactive-bulletin.html and a post just about the Sabbath @ http://tinyurl.com/kjfb6v9 . When you study the book of Acts which is about the early Christians after Jesus died, they all worshipped on the first day of the week, which is Sunday such as Acts 20:7. Thanks for stopping by. Thank you for the materials! Great Stuff!